Here is a review of the supplement Focus Plus Shot. The company states that this product was meant for people such as professionals or students who struggle with mental clarity, focus, and other cognition functions. They claim this product has no harmful effects and is chock full of healthy vitamins and minerals which are meant to enhance cognitive function. If you wish to learn more about this product, please keep reading this review. It is recommended that new users start with half of the 2 ounce bottle before taking the entire dosage. You can take up to two bottles spaced out between several hours. They do state that since everyone is different, your dosage may be different from another person. The company states there are no harmful side effects but they do state there are two groups of people who should not take this product. Children who are currently 12 years or younger should not take this product and women who are nursing or pregnant should avoid this as well. However, we always recommend you speak and consult with your doctor before taking any new type of supplement, especially if you have an existing condition or are currently taking any type of prescription medication. This product comes in different sized packs. The smallest pack is four, 2 ounce bottles at $11.35. You can then go up to 8 bottles, 12 bottles, and 24 bottles. The best deal is the package with the most bottles, saving you over 20 percent. The company also allows you to subscribe for an auto renewal option. There is no information on a guarantee found on this website. It is a little unsettling especially for those who are new to the product and simply wish to try it out. There is an option to contact the company, which is perhaps the only way to inquire as to whether or not they accept returns. Upon thorough research we could not find reviews from other seller sites. There are some reviews on the company’s website itself; but, a new customer should be wary these reviews can be biased and be aware that there are some companies who will only put up solid and positive reviews. 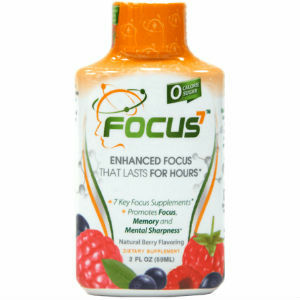 Focus Plus Shot is a different way to gain mental clarity and focus. Instead of it being a tablet or supplement, it comes in a quick to absorb liquid. However, while this may be an alternative way to get focused and zone, the lack of guarantee is definitely something which can throw a customer off. No one wants to try a product or even purchase a product with the risk of knowing they may waste their money. Henry Costa	reviewed Focus Plus Shot	on November 20th	 and gave it a rating of 2.5.